CANBERRA, Australia (AP) — A flying drone has dropped a flotation device to two teens caught in a riptide in heavy seas off the Australian coast in what officials describe as a world-first rescue. Monty Greenslade and Gabe Vidler got into trouble on Thursday at Lennox Head, 750 kilometers (470 miles) north of Sydney. 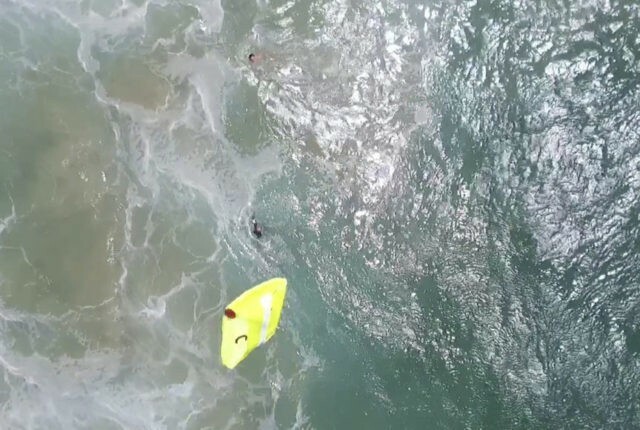 They were about a kilometer (0.6 mile) from lifeguards who were about to start training with the new drones, equipped with a camera, rescue gear and six rotors. After a friend raised the alert, lifeguard Jai Sheridan said he piloted the drone to the swimmers and dropped a rescue pod minutes faster than lifeguards could have reached the pair by conventional means. “I was able to launch it, fly it to the location, and drop the pod all in about one to two minutes. On a normal day, that would have taken our lifeguards a few minutes longer to reach the members of the public,” Sheridan said in a statement. Greenslade, 16, said Friday the pair were lucky that the drone had been nearby. “With the heavy waves, we were sort of going under and coming up for breath and … the drone dropped the package and we both grabbed on pretty quickly. It’s kind of obvious what you’re supposed to do with it,” he added. “It just dropped the life raft and so we just held on to that and just swam into shore,” Vidler said. It was the first drone rescue since the New South Wales state government last month invested 430,000 Australian dollars ($345,000) in drone technology for rescue and shark spotting work in the state’s north.